Employment in professional and business services increased by 49,000 in July. Computer systems design added 7,000 jobs, and employment in temporary help services continued to trend up (+14,000). Within leisure and hospitality, employment in food services and drinking places rose by 29,000 over the month and by 292,000 over the past 12 months. Manufacturing employment rose in July (+25,000), with nearly all of the increase in durable goods manufacturing. Within durable goods, the motor vehicles and parts industry had fewer seasonal layoffs than is typical for July, contributing to a seasonally adjusted employment increase of 13,000. Employment continued to trend up in fabricated metal products (+5,000). Employment continued to trend up in health care in July (+12,000), with over-the-month gains in outpatient care centers (+4,000) and in hospitals (+5,000). Employment also continued to trend up in wholesale trade. 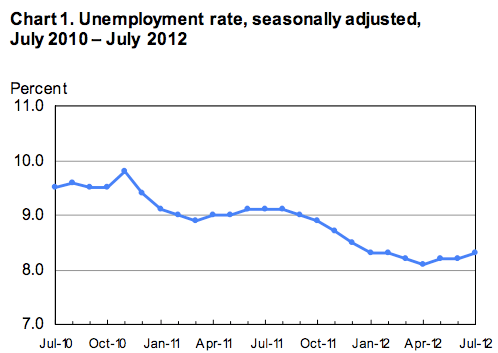 Utilities employment declined in July (-8,000). The decrease reflects 8,500 utility workers who were off payrolls due to a labor-management dispute. Employment in other major industries, including mining and logging, construction, retail trade, transportation and warehousing, financial activities, and government, showed little or no change over the month. Both the number of unemployed persons (12.8 million) and the unemployment rate (8.3 percent) were essentially unchanged in July. 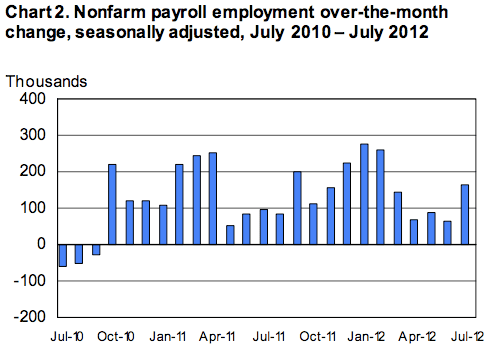 Both measures have shown little movement thus far in 2012. Persons marginally attached to the labor force are those who currently are neither working nor looking for work but indicate that they want and are available for a job and have looked for work sometime in the past 12 months. Discouraged workers, a subset of the marginally attached, have given a job-market related reason for not currently looking for work. Persons employed part time for economic reasons are those who want and are available for full-time work but have had to settle for a part-time schedule. As I keep reminding everyone, there are two separate surveys used to develop this data. A survey of payroll establishments is used to determine the headline number of jobs gained or lost each month. A survey of households, which has a broader definition of the word “work”, is used to determine the unemployment rate. All of this data has also been adjusted to account for ordinary seasonal trends, although it’s fair to say that the seasonal adjustments have been a bit more questionable since the financial crisis and deep recession. Warm winter weather across the U.S. this year also caused many of us to question the seasonal adjustment process. The U.S. economy continues on a slow recovery. Given slowdowns in Europe and China and the long hangover from the housing bust, there’s very little prospect of a dramatically increased pace of recovery anytime soon.